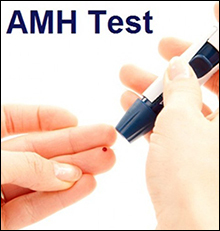 'AMH' is an acronym for 'Anti-Mullerian Hormone' which is produced directly by the ovarian follicles. Specifically, AMH -- also known as MIS (Mullerian Inhibiting Substance) -- is produced by the granulosa cells which comprise the lining of the ovarian follicles. The secretion of AMH is largely related to small antral follicles in the ovary which are sized between 5mm and 8mm. Since AMH is a protein which is produced by cells in ovarian follicles, the AMH levels in women are directly linked to the number of antral follicles in the ovaries --- a low AMH level in women indicates a low count of antral follicles in the ovaries, and, thus, the production of a low number of oocytes as compared to women with high AMH levels. Very low AMH levels: below .5 mg/ml. Besides these three AMH levels, some women may also have ‘High AMH levels’ (more than 4 mg/ml), which can potentially increase the risk of breast cancer (particularly in premenopausal women) and can also be an indication of a hormonal disorder called ‘Polycystic ovary syndrome’ (PCOS) which is quite common in women of reproductive age. AMH level testing was first developed in the year 1990, and has now become a part of the standard procedure for female fertility tests. AMH level testing is very useful for young women who want to check their potential for bearing a child, especially if they want to delay their pregnancy. Moreover, the testing of AMH levels is also very important for women who are dealing with infertility issues. If AMH levels are in the ‘Normal’ range, a woman is believed to have high chances of fertility, along with a high response rate to fertility treatments. AMH levels in the ‘Low-Normal’ range are linked to decreased ovarian reserve in a woman, but with good chances for pregnancy outcomes. AHM levels in the ‘Very low’ range are indicative of diminished ovarian reserve in a woman as well as fertility concerns. One of the main reasons for low AMH levels is ‘aging.’ Other than aging, some of the key factors which can affect AMH levels and ovarian function include: early ovarian aging because of stress, low circulation to the ovaries, genetic factors, hormonal imbalance, certain lifestyle factors, unhealthy eating habits, illness, injury, and autoimmune disorders. If AMH levels are low in women aged less than 35 years, they can increase the risk of early menopause. To manage healthy AMH levels and to preserve and enhance female fertility, Ayurvedic products can be very beneficial. These capsules are prepared from potent herbs which can synergistically control vitiated ‘Vata’ which causes irregular painful menstruation, and excess ‘Pitta’ which causes heavy bleeding, hot flushes and irritability. The herbs used for this formulation include Shatavari (Asparagus racemosus), Ashok (Saraca indica), and Lodhra (Symplocus racemosa). These capsules are a remarkable herbal formulation for overall female health. The capsules are helpful in regulating female menstrual cycles, strengthening female reproductive system, treating leucorrhoea, regulating female hormonal system, and treating painful menstruation. These capsules are prepared from the standardized extracts of the ‘Shatavari’ herb (Asparagus racemosus) which has the ability to enhance the overall strength of the body. The herb is known for its excellent antioxidant properties, and it can nourish the tissues of the body. These tablets are prepared from a combination of potent herbs which include: Karpura (Cinnamomum camphora), Shilajit (Asphaltum), Guggulu (Commiphora mukul), Vacha (Acorus calamus), Mustak (Cyperus rotundus), Haritaki (Terminalia chebula), Vibhitaki (Terminalia bellirica), Amalaki (Emblica officinalis), Haridra (Curcuma longa), Pippali (Piper longum), Shunti (Zingiber officinalis), Maricha (Piper nigrum), Danti (Baliospermum montanum), Chavya (Piper chaba), Vidanga (Embelia ribes), Tejpatta (Cinnamomum tamala), Dalchini (Cinnamomum zeylanicum), Ela (Elettaria cardamomum), Yavkshaar (Potassium carbonate), Sarjikshaar (Sodium carbonate), Saindhava Lavana (Rock salt), Sauvarchala Lavana (Sodium sulphate), Vida Lavana (Black salt), and Sharkara (Sugar). The herbal components of Chanderprabha Vati tablets have the combined ability to support female (and male) reproductive organs, treat genital and urinary tract problems, eliminate toxins from the body, purify the blood, treat ovarian cysts, shrink fibroids, and treat bladder-related disorders. This amazing herbal powder is prepared from a blend of potent herbs which can manage a number of female-health problems. The herbal ingredients of this churna include Ashok (Saraca indica), Lodhra (Symplocus racemosa), Arjuna (Terminalia arjuna), and Udumbur (Ficus glomarata). The use of this churna is beneficial in managing several problems faced by females, including Menopausal Syndrome, ovarian cysts, uterine fibroids, painful menstruation, irregular or heavy monthly periods, dysfunctional uterine bleeding, and pre-menstrual syndrome (PMS). Planet Ayurveda's herbal formulations for managing AMH levels in women are prepared from 100% pure and natural herbs. These formulations are absolutely safe to use, because they do not contain any chemicals, additives or preservatives.